PENSACOLA, FLA - What areas of your home do you want to remain private? Your bedroom ... your home office ... your master bathroom? "Too-close houses in space-restricted neighborhoods can make gaining privacy in the home a real challenge," says Roger Murphy, president of Hy-Lite, a U.S. Block Windows Company. "When people can easily look into a first floor bathroom or your child's bedroom, that's too close for comfort." Murphy recommends a simple solution to feel at ease in your own home: privacy windows. "Obscure privacy windows let light into a room while preventing nosy neighbors from peering in your house," says Murphy. "Available in many sizes and styles, privacy windows can be ordered in fixed or operable styles, to open up and allow in breezes when you want." Decorative glass privacy windows, like the Mission, Prairie, Metro and Baroque styles of the Home Designer Collection, include vinyl-framed windows with silk-screened designs. Textured privacy glass on the exterior assures security of the windows. "Each window has been designed to complement other elements of the home without clashing with designer focus points in a room, such as tiles or cabinetry," says Murphy. "Windows in this collection are ideal for a variety of locations in a house, like family rooms, dining rooms and foyers. "Why should you have to worry about constantly opening and closing window treatments to protect your privacy when there are so many worry-free decorative alternatives with privacy windows? If you're living in a home that looks directly into your neighbor's yard, or you're close enough to the street for passersby to wave in at you, it's definitely time to replace an existing plain glass window with a privacy window." For homeowners with limited space, but big desires for privacy, Hy-Lite offers long, thin transom privacy windows, geometric and oval shaped windows. 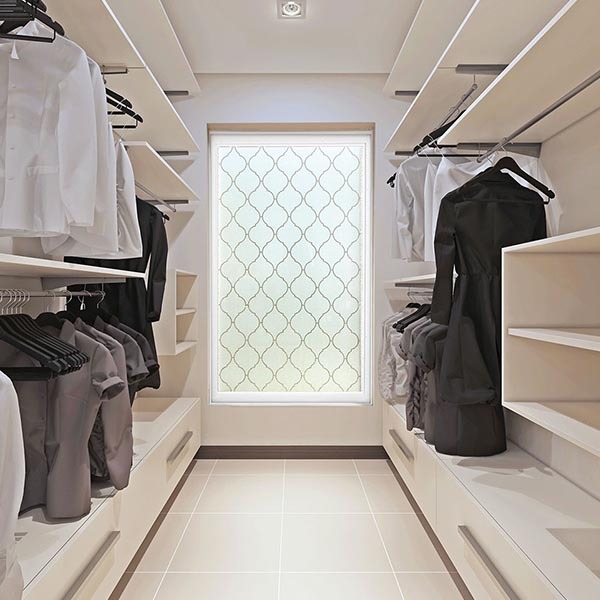 The company also custom manufactures concealing acrylic block and glass block windows. Following the motto of "safety first" in the home, Murphy reports that privacy windows have a huge advantage over using blinds, shades and curtains on clear glass windows: there are no dangling window cords. "Seclusion is instant and continuous with privacy windows," says Murphy. "There are no cords or pulls that children can get strangled with or pets can get tangled up in. That's a huge no-worries advantage of selecting privacy windows for the home." Another safety advantage is the ability to select an impact-resistant privacy window that can stand up to severe weather conditions. The Storm-Lite silkscreened glass window brings beauty, privacy and security into the home at an affordable price. Available in a 4' x 4' size, the decorative glass window is certified to AAMA 506-06 specifications for Hurricane Impact and Cycle Testing, and has a Design Pressure Rating of DP50 for winds up to 160 mph in Wind Zone 4. "There's a one-inch insulated unit with an annealed, laminated exterior glass to resist impact from flying debris," says Murphy. "There's also tempered glass on the interior of each unit for enhanced safety. This tough window stands up to Mother Nature while bringing both style and peace-of-mind to homeowners."